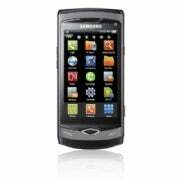 For one, the Samsung Wave sports Samsung's new Super AMOLED display technology. I've praised Samsung's AMOLED phones in the past for their excellent viewing angles and vivid colors, but have been disappointed by their performance outdoors. According to Samsung, Super AMOLED fixes this: The technology offers a brighter, clearer and less reflective display. The Wave has a 3.3-inch display-a bit small compared to other smartphones on the market-with an 800-by-480-pixel resolution. The Wave also runs TouchWiz 3.0, Samsung's proprietary user interface we've seen on the company's Android, Windows Mobile and high-end feature phones. As the name implies, TouchWiz is very touch-friendly, though on older Samsung phones, I've found it to be sluggish and not always intuitive. According to Samsung, TouchWiz 3.0 lets you customize your homescreen with widget versions of your favorite social networks, like Facebook or Twitter. The Wave is powered by a 1GHz processor -- the same speed as the Snapdragon processor in the Google Nexus One. This will be a boon for watching videos on the Wave's sharp display. It will also, hopefully, speed up the TouchWiz interface. The Wave also supports DivX, Xvid, MP4 and WMV video formats as well as HD video (720P) decoding and recording. On top of everything else, the Wave also supports Bluetooth 3.0 as well as the Wi-Fi 802.11n standard. on time at the show, I'll feel otherwise. Samsung says the OS will have an ecosystem of apps as well as a store built-in to the OS so users can obtain them easily. I wonder, though, how large their developer community is and whether Bada's app store will really take off. Pricing and availability have not been announced. Check PCWorld.com for up-to-the-minute blogs, stories, photos, and video from the world's largest mobile electronics show.